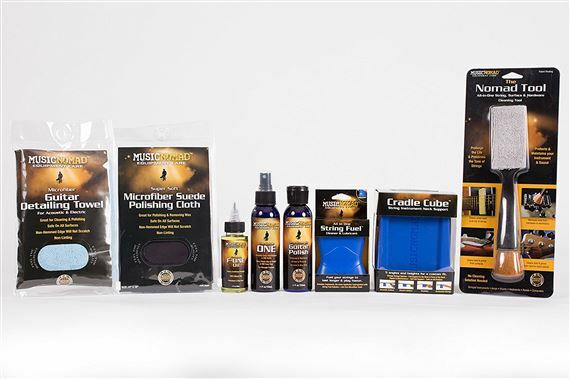 Order your Music Nomad MN143 Complete Guitar Care Kit from AMS and enjoy Fast & Free Shipping. Get the Best Deal with our Lowest Price Guarantee & Great Customer Service! 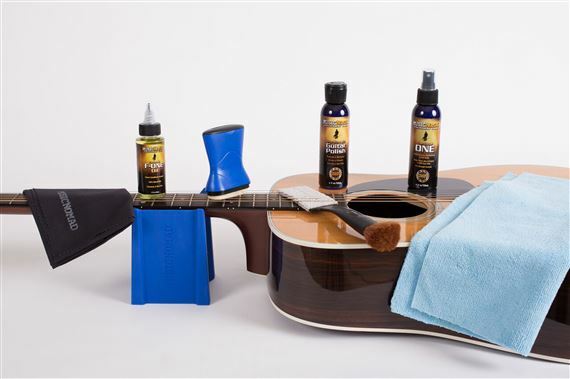 Give your guitar some love with the Complete Guitar Care Kit. This kit from Music Nomad has everything you need to keep a showroom shine and ready for your next gig. Music Nomad professional grade products are used in the factories at Taylor, Vigier, Tom Anderson and many others. And they smell great! 4 oz Guitar Polish with micro-fine polishing compound to take out oxidation, hazing, sweat and beer stains along with revitalizing metal components. 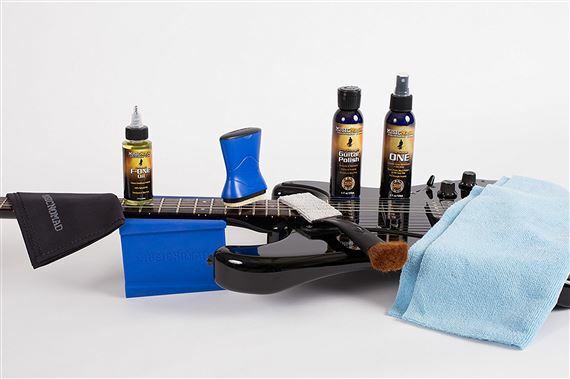 4 oz Guitar ONE an all in one polish to clean, polish and wax all in one spray. For gloss finishes and great for everyday cleaning. 2 oz. F-ONE Fretboard Cleaner and Conditioner This all natural oil cleans while it conditions. Free of lemon oil and detergents that may loosen frets. String Fuel One swipe cleans and lubricates strings for sliding. Petroleum free, safe on fretboards. Handy cloth included to wipe up excess oil and condition fretboard. Microfiber Suede Polishing Cloth works well in combination with F-ONE to clean fretboard. Microfiber Guitar Detailing Towel works well with Guitar ONE for cleaning the body. Nomad Tool A proprietary tool with a microfiber towel end that cleans under the bridge and strings. Flip it over and use soft brush to dust off body. Cradle Cube Neck Support has 5 angles to support electric, acoustic and bass guitars. A necessity for string changes and general guitar care. Didn't really need this kit, but glad that I got it. Makes keeping my guitars in top shape much easier.